At the same time that greyhound racing is slowly ending in the United States and Britain, it is trying to expand in other parts of the world. Sadly, this expansion is already resulting in the suffering and death of thousands of dogs. One terrible example is the Canidrome in Macau. As the only operational greyhound racetrack in Asia, it exists by importing dogs from Australia. The dogs race for a short period of time, and are killed when they are no longer profitable. According to a former director of Macau's Civil and Municipal Affairs Bureau, the track does not allow greyhounds to be put up for adoption because it doesn't want "complaints about the dogs causing problems or damage." Reporting by the South China Morning Post indicates that 383 greyhounds were euthanized in Macau in 2010, and 45 dogs died at the track in a single month earlier this year. This is not a new problem, and the greyhound racing industry has been aware of severe humane issues at the Canidrome since at least 2008, when rampant euthanasia was reported by Time Magazine. Despite this reporting, Australian greyhound breeders and regulators have turned a blind eye to Macau, and allowed this cycle of death to continue. 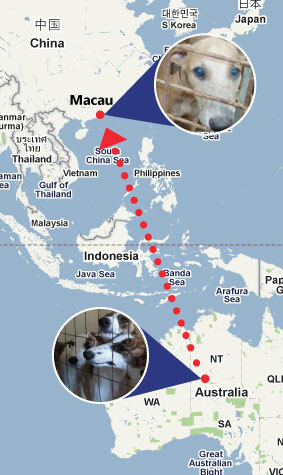 Thankfully, there is now a real effort underway to help Macau's greyhounds. Last month, Chinese animal welfare groups wrote to the Prime Minister of Australia calling for a ban on the exportation of greyhounds to the Canidrome. Following this announcement animal protection groups from across the globe, including GREY2K USA and Greytexploitations, added our voices to the debate. We recently launched an online petition that has already accumulated more than 5,000 signatures, and our campaign was reported yesterday by the South China Morning Post. More media attention is now being focused on the Canidrome than ever before, and this weekend an Australian television station also aired a groundbreaking report on greyhounds dying at the track. 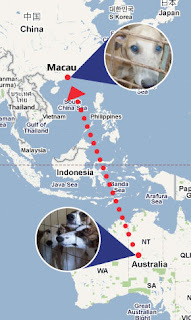 "There is no way out for the Canidrome greyhounds, as they cannot be adopted and cannot leave Macau. Out of touch with 21st century mores, Macau lacks licensed veterinarians and lacks current animal welfare laws, instead relying on statutes dating back to the 19th century. The result is that the unfortunate pawns in this scenario, the Canidrome greyhounds face a bleak prospect and are routinely killed." I agree wholeheartedly with Caryn's sentiments, and am hopeful that we will soon see greyhound racing end at this cruel racetrack. thank you for bringing attention to this & your dedicated work! even in Macau, we must work to put an end to this while educating on greys gentle spirit.